Bringing the concepts of Anything, Anywhere, and Anytime together. American research has long been the engine for the growth of our nation’s gross domestic product. The YAS Research arm is 40 years old and continues its mission through the University of New Hampshire’s Broadband Center of Excellence (BCOE). That organization is an interdisciplinary academy designed to establish UNH as a global leader in maximizing the effectiveness of broadband technologies on commerce, innovation, competitiveness and quality of life. The American dream has been empowered by the entrepreneurial spirit of innovation through business start-ups and a commitment to developing the next great thing. As one of the leading advocates of that spirit, Dr. Rouzbeh Yassini has been recognized as a serial entrepreneur in advanced technology since 1987. Rouzbeh and his distinguished team members have been instrumental in creating the broadband internet for global citizens. As such, his LANcity team and YAS Broadband Ventures have been engaged in strategic investments in several start-ups. YAS Foundation’s philanthropic nature is dedicated to expanding and strengthening future generations of global leaders by pledging to gift its time and wealth for the betterment of education, culture, and humanity. As such, since its establishment, it has gifted its broadband knowledge center (YBKC) to the University of New Hampshire to serve as a platform on which each global citizen can access broadband. In addition to donating the $10 million YBKC, the foundation then committed $1 million and the volunteer services of Dr. Rouzbeh Yassini. “A big leap forward” Rouzbeh Yassini, Founder and Executive Director of UNH Broadband Center of Excellence, comments on the potential afforded by broadband accessibility for the small town of Chesterfield, the first NH town to approve investment in bringing fiber to every home and business in this community of 3,500 people . In 2003, Dr. Rouzbeh Yassini authored “Planet Broadband”, a book in which he uses his four decades of broadband leadership to explain that the ultimate experience is enhanced by having ubiquitous broadband connectivity for everyone around the world. Today, broadband is recognized as a “must have” in the same context as electricity and water. But this was not always the case and Planet Broadband explains the origins of the information economy and the role that broadband has played to serve as the platform for today’s Gig economy. Beginning with the invention of the cable modem, in which Dr. Yassini had the major role, broadband has served as the enabling platform for today’s digital world economy, which of course entails social networking, online shopping, digital healthcare, smart cities and the autonomous driverless cars. All now are a part of today’s gig economy. As the 21st Century embraces the information age, we are enjoying the innovation, commerce, economic growth, and quality of life that Planet Broadband predicted. WE'VE CREATED A POWERFUL TECHNOLOGY. except some people cannot get on the carpet. 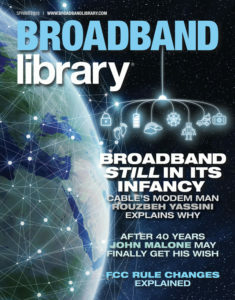 Broadband connectivity is an essential component of life. Cable’s Modem Man Looks Back. And Ahead. More than 30 years ago Dr.Rouzbeh Yassini, the CEO of a then unheralded tech company named LANcity, began leading a 13-person team that worked tirelessly to develop the first-ever cable modem. Their pioneering invention would lead to cable’s historic DOCSIS specifications and would ultimately usher in the modern global broadband era and a multi-billion-dollar broadband industry. Dr. Yassini has long been driven by his passionate vision to bring affordable broadband to all, regardless of their economic status. In his view, it’s every citizen’s right to be empowered and enabled by the essential connectivity of broadband. The potential for broadband to advance medical technologies, intelligent cities, Smart Campuses, telemedicine, connected cars and highways is vast given our strengths in innovation, creative problem solving and initiative. In 2008, Dr. Yassini launched the Yassini Broadband Knowledge Center in Boston, offering research grants and facilities to investigate fresh ideas in broadband technology. These programs were transferred to UNH through the Broadband Center of Excellence in 2012, where Dr. Yassini served as Executive Director. Of primary importance to realizing his continuing vision and one of the objectives of the UNH BCOE, is to create a much needed broadband era of funding for the research to empower this country’s world leadership in broadband innovation. Dr. Yassini holds an Honorary Ph.D. in Science and a B.S. in Electrical Engineering from West Virginia University; an Honorary Ph.D. from Merrimack College; and an equivalent MBA from General Electric’s Financial Management Program. Dr. Yassini is a member of the Lane Department Academy and the West Virginia University Academy of Distinguished Alumni.